Steady, No-Runout Consistency & Profits to Win, Place & Show! 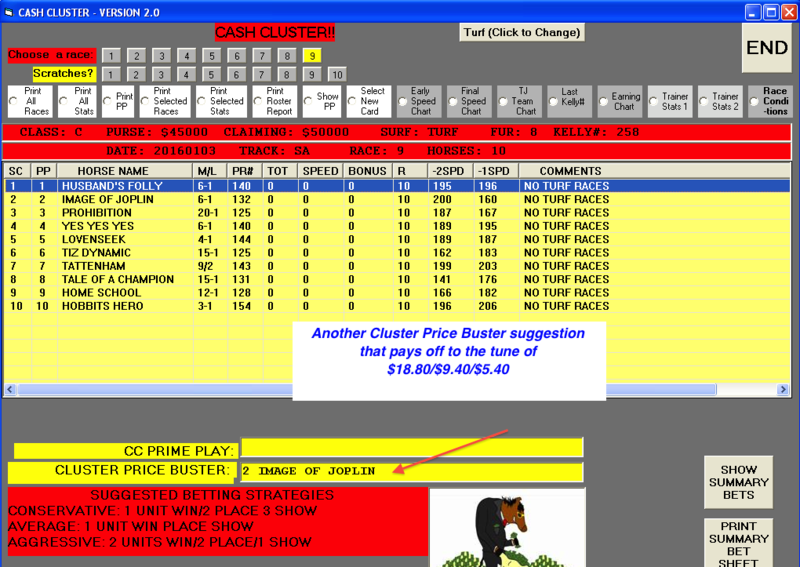 Documented 37-Day Test (included with purchase) showed a $4,600+ Profit on Win/Place/Show wagered combined! Main Screen above. 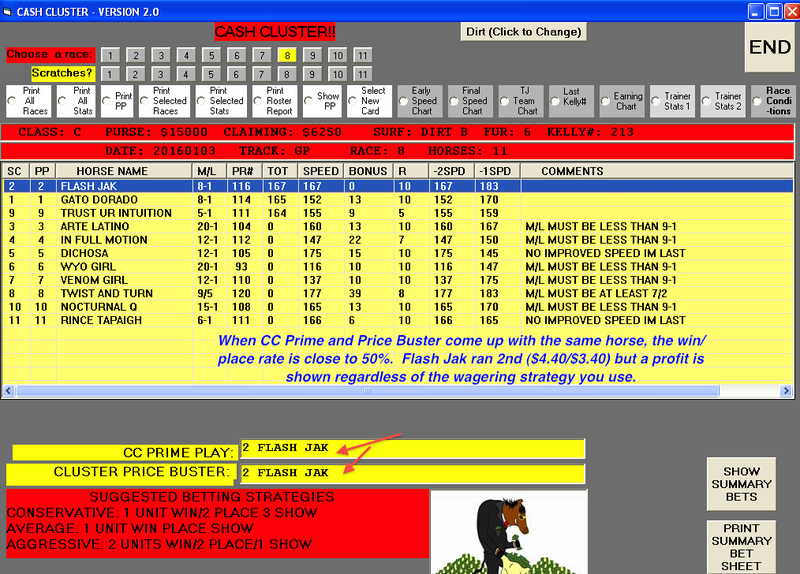 Cash Cluster locates viable cash-in situations using a combination of Positive Speed Analysis (-2SPD & -1SPD columns), BONUS (points awarded to certain trainer stats applicable to today’s race), and SPEED (adjusted for previous factors). 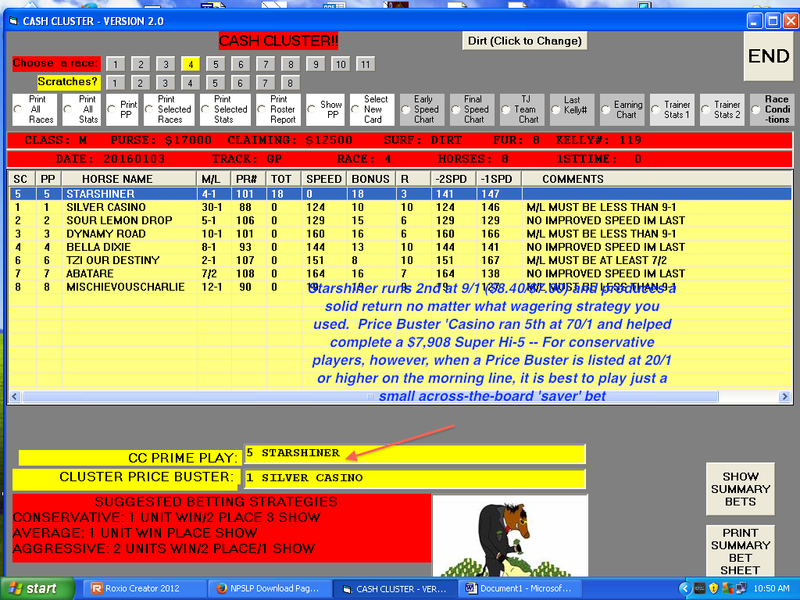 CC Prime Play = the most viable play in today’s race; Cluster Price Buster = longshot opportunity. The last time I was in ‘Vegas, in December, I met with my friend Jeff Sillifant. 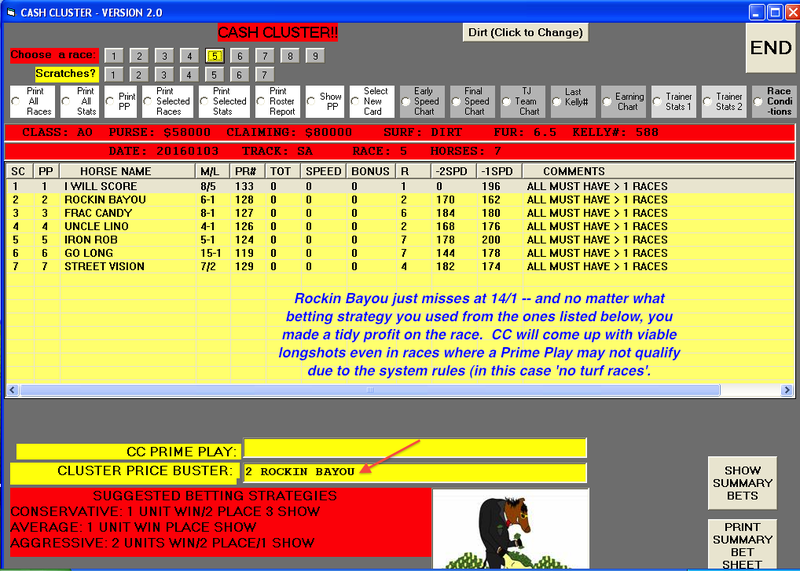 Jeff, as many of you know, is one of the most prolific handicapping system writers on the scene today. His The Sound System, in fact, is one of the best selling methods of play of all time, not only here in the states, but in Canada, Australia and Hong Kong as well. It’s a remarkably profitable, systematic approach to cashing mutual tickets and its success has been documented far and wide. Jeff also authored the highly successful Works For Cash, II and the 3-D System. Our meeting was twofold: One, just to visit and gab about old times and, two, to discuss his newest method, which he said I had to ‘see to believe’. Words like that seldom tumble from Jeff’s lips, so I knew he was very excited about his new discovery. He called it the The Cash Cluster. ‘Cluster’ because the payoffs seemed to come in ‘clusters’, or ‘winning streaks’ as I would call them, and the losses in between the ‘clusters’ were always very brief. The system’s profits were based on an across-the-board wager and good returns were shown for win, place and, yes, even ‘show’. 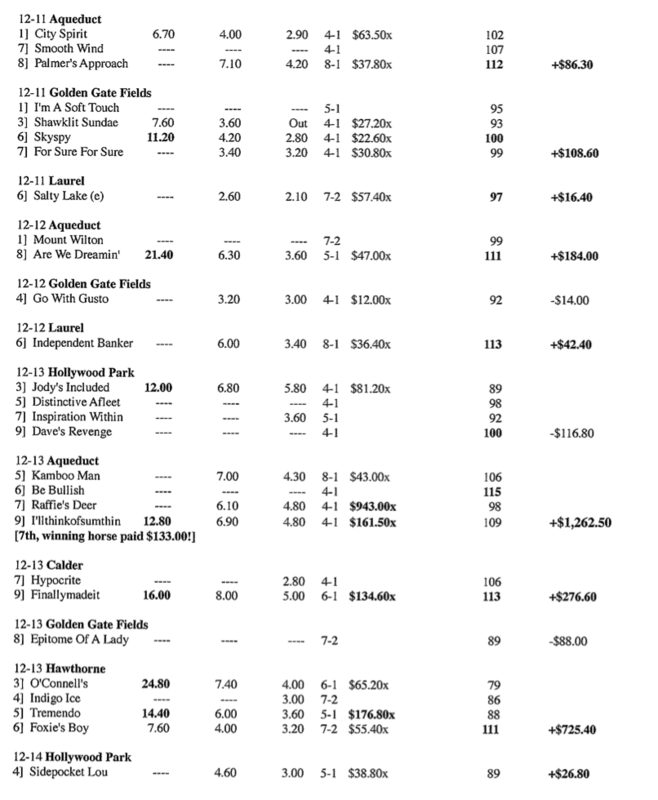 The Exactas added some hefty profits as well, with most paying in the $70 to $210 range. Was I impressed? Definitely. But this was only one day and 12 plays. I was going to be in ‘Vegas another four days so I told Jeff I’d continue to test his PPS. Well folks, I experienced only one losing day in the next four, a -$39 day, and racked up another +$516 on the other three. 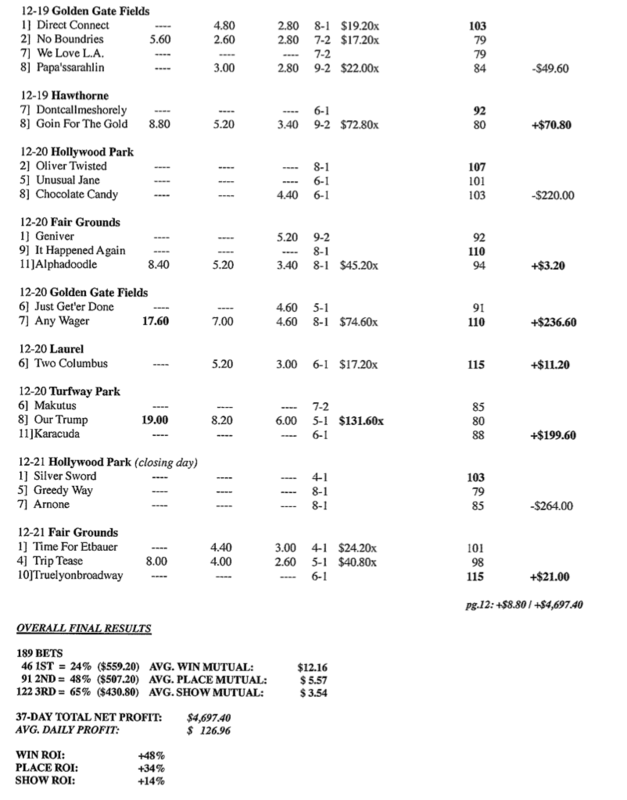 I wasn’t playing the Exactas, but they would have added another $633 (one Exacta paid $210) to the pot. And it was only on day four that it dawned on me what Jeff was doing with CC, and it was absolutely ingenious, though he tells me he and an unnamed partner came up with it purely by fluke, and no genius was involved. OK, let’s just call it ‘inadvertent’ genius! 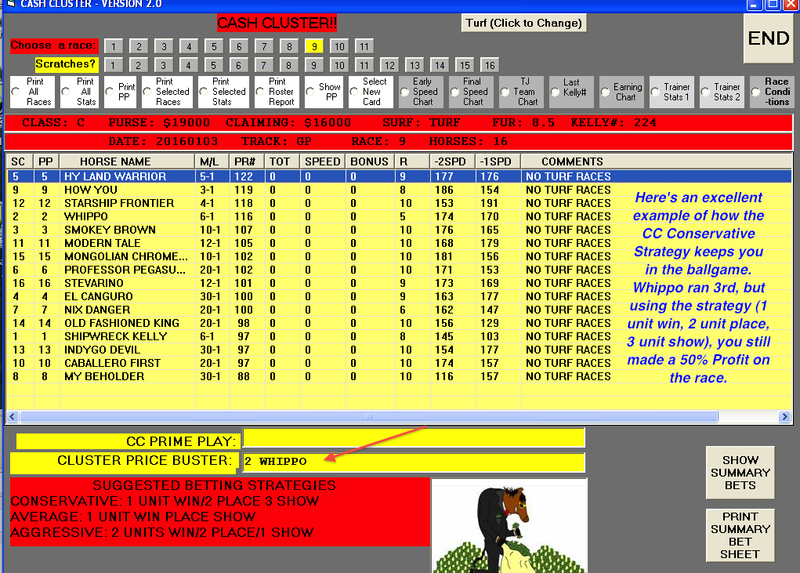 I continued to follow the Cash Cluster when I got back, and the results continued to amaze me. Just when I thought I’d seen everything this game has to offer, BOOM, along comes something that knocks your socks off. And the fascinating thing about CC is that it pays off as well even if you aren’t someplace where you can monitor the near-post-time odds. And you know what: you don’t have to do it everyday. If you only go out to the track a couple days a week the long term results are still going to reflect the results we have realized in our tests and actual play. And, this is a method you can use ‘on the side’, so to speak, meaning that it is so simple and consumes so little time that you just play the horses when they qualify, while at the same time you can be doing your other ‘things’ at the track — your longshot play — your computer play, etc. And all the time you will know that CC is grinding out a nice profit for you. I don’t want to sound like I’m ‘overselling’ this thing. I know I don’t normally get this exited about a product, but there are two important things you need to know about Jeff, well, make that three: #1), he is retired, has been since age 52; →#2), he makes a nice supplemental living at the racetrack Using his methods and, #3), he is honest as the day is long! 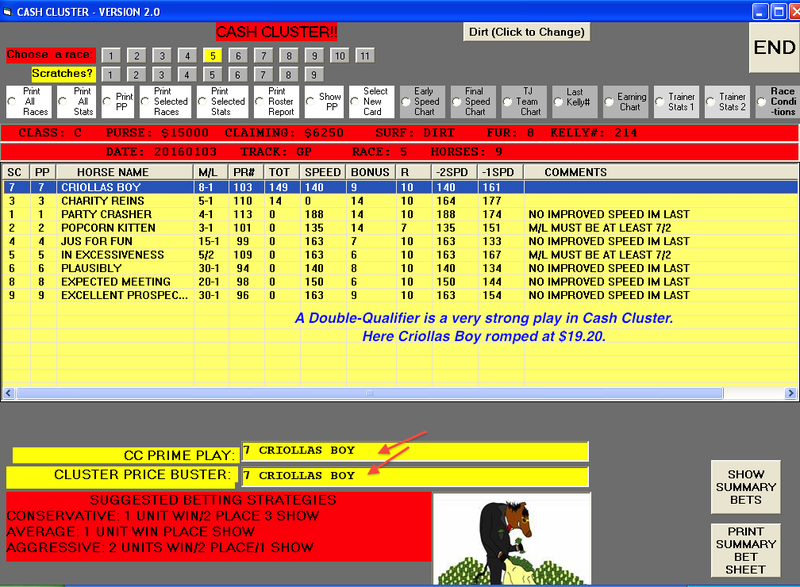 Cash Cluster is designed to come up with solid prices on ‘obvious’ horses. You can wager any way you wish, but Jeff provides three suggested wagering strategies. ♠You can immediately see that when wagering as Jeff’s conservative strategy suggests (1 unit win, 2 units place, 3 units show), that you will be making a profit on roughly 70% of the bets you make. Note also some of the very nice win prices and pay attention to the Place and Show payoffs — you can see that you often have long winning streaks and a long runout is 3! And, most importantly, at the end of the ‘live’ test – note that the TOTAL PROFIT was $4,697! or an average of $126.96 Profit per Day!! After just a few days, you will understand the genius of the title as, indeed, ‘Clusters’ of Cash will come your way! Call 1-800-696-0067 to order, or order from our website.